Foreign Secretary David Miliband is the latest politician to weigh into the controversy surrounding photography in public places. Miliband, who is the MP for South Shields, revealed that a number of his constituents have contacted him regarding photography in public. He was responding to a complaint by keen photographer Graham Rigg, 51, who was wrongly stopped by police on South Shields seafront. Police acted after a member of the public claimed Graham had been taking pictures, from the window of his car, of children playing nearby. Miliband sought a response from Home Office Minister Tony McNulty who, writing in general terms, confirmed there is ?no legal restriction on photography in public places?. 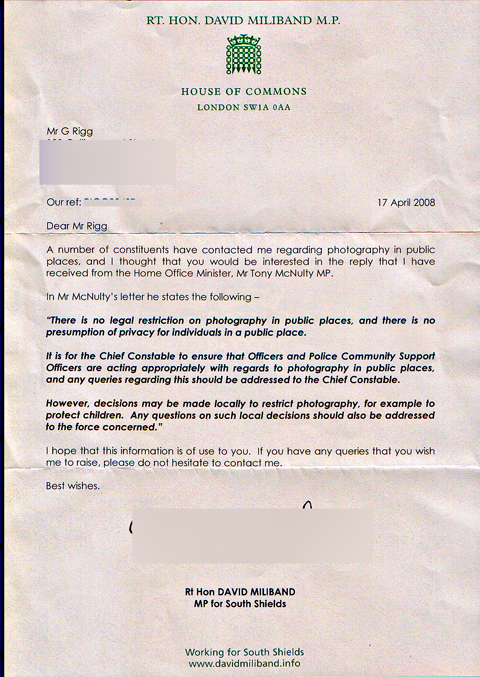 In his reply to the South Shields MP McNulty added: ?It is for the Chief Constable to ensure that Officers and Police Community Support Officers are acting appropriately with regard to photography in public places, and any queries regarding this should be addressed to the Chief Constable.? Graham Rigg was ordered to lock up his vehicle and sit in the back of a patrol car when he was stopped by police on Easter Monday, reports The Shields Gazette. Hitting out at the police response, Graham told the newspaper: ?There were hundreds of people taking photos that day on digital cameras and their mobile phones ? so why pick on me? We live in a society where people are treated as suspects from the outset.? After checking the images on the back of his Pentax K100D digital SLR Northumbria Police promptly apologised for the error. Graham Rigg told Amateur Photographer (AP): ?I was fairly clear where I stood. I am more concerned that it seems police officers, PCSOs, security guards and other members of the public aren?t clear on what the law is? they take it upon themselves to make up a rule as and when, saying ?you can?t do that?.? Northumbria Police superintendent Paul Beasley said: ?This incident arose from a concern about a lone male taking pictures of what was believed to be young children. ‘This is obviously an emotive issue, which would generate significant public concern. ?In order to ensure the safety of children in the South Shields area we took steps to ensure that the man?s motives were genuine and once this was established there was no further police action taken. ?This man was not arrested and was cooperative throughout. He did not express any concern to the officers when stopped and spoken to and seemed to understand the action undertaken.? For more on this story keep an eye out for Amateur Photographer magazine, in shops each Tuesday.